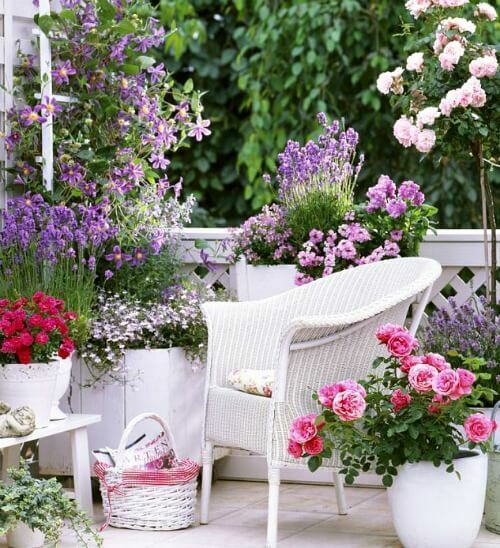 Miniature roses are ideal for balconies, roofs and patios. Usually these bushes grow to no more than 18 inches in height. Hybrid teas have large roses but flower less. One flower grows on a long upright stem. They can grow as tall as 6 feet and one bloom can be up to 5 inches in diameter. These roses are very popular. Floribundas produce a cluster of flowers on top of each stem. Their blooms are smaller than tea roses. They can grow up to 3 feet tall. Ground cover roses stay low and spill over the side of your container. Depending on the size of your pot and the ground cover variety, you could also possibly use it as a border around a larger plant. Patio roses grow between 18-24 inches tall. They are compact in size and grow well in containers. When you are choosing your rose plant, check the tag for the USDA Hardiness Zone. When it comes to choosing a container for your rose plant, bigger is better. Roses are deep rooted, so tall pots are better than short ones. The bigger the pot the less you’ll have to water. 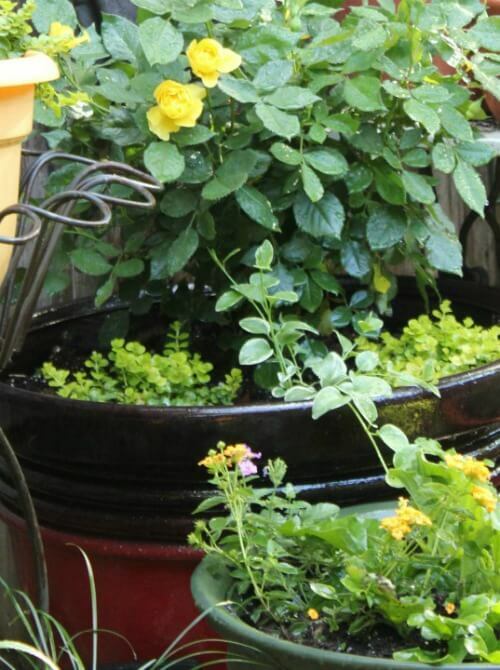 Make sure you have drainage holes in the bottom of your pot because you must have good drainage for roses. I have my yellow roses in a 24 inch diameter plastic pot. I ordered it from Walmart.com. All roses need at least 6 hours of direct sunlight to produce flowers. Use a container soil that drains well to reduce root rot but is heavy enough to hold some water. If you are uncertain, ask someone at the nursery where you purchase your soil. Cover drainage holes with landscape fabric. Pre-moisten soil. Loosen roots to encourage spreading with new growth. Position in pot. 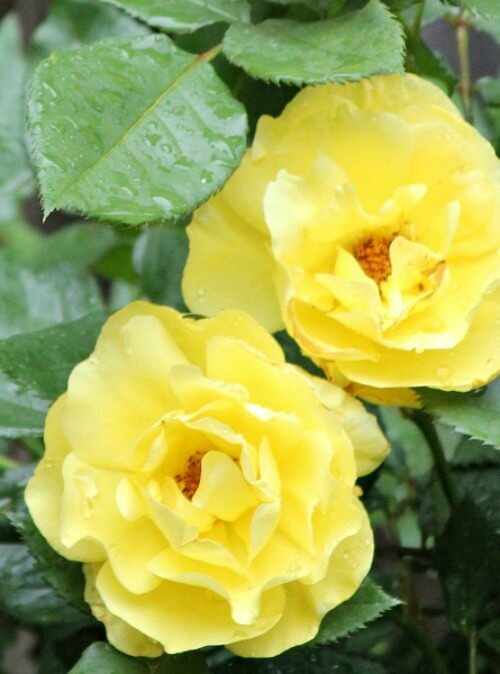 Sit the rose plant where it will come to about an inch below the top rim of your container. Fill in the remaining space with your pre-moistened soil. Lightly pat down the soil to eliminate air pockets. Add rose fertilizer. Cover the fertilizer with 1/4 inch soil and add soil until it is about 1 inch from top of pot. Mulch to help retain moisture. Sprinkle 1/2 cup of Epsom salt on top of the mulch. A good rule of thumb is to water when the top of the surface is dry. The soil should have as much moisture as a rung out sponge. If you water earlier than 10 a.m. or later than 6 p.m. you will have more success. That time in between is the hottest part of the day and water will evaporate quickly. Try not to water the leaves because wet leaves can lead to powdery mildew. Roses cannot tolerate drought. I check the top two inches of soil and if it is dry, I water. Apply plant food for container-grown plants according to its directions. I buy fertilizer specifically for roses. Stop feeding about 6 – 8 weeks before the first expected frost, to discourage new growth that could be killed back during winter. As with full-sized roses, deadheading is pretty much all the pruning you need to do during the growing season. You don’t need to cut back minis in the fall. In the spring prune away any dead parts. Prune just as you would larger varieties and keep the soil under it cleaned from fallen leaves or petals. Every few years change out the soil. The plant will have depleted some of the soil nutrients by then. Many gardeners swear by Epsom salt. The recommendation for applying Epsom salt to existing rose bushes is to mix ½ cup of Epsom salts into the soil around the rose bush and water well. Do this in the spring, just as the buds are beginning to open. Yellowing leaves are a sign that your plant is suffering from magnesium deficiency. Avoid getting Epsom salt on leaves as it could scorch them. Roses of all sizes love coffee, tea grounds and banana peels. Spoon some coffee or tea grounds periodically on the soil under the rose. Dig a small hole near the rose, stick a piece of banana peel in and cover it up. Every fall, those in cooler zones should plan out what they will do to protect their container roses from winter freezes. Plants in pots get much colder than those in the ground. For your rose to be able to survive the winter, it should be rated at least two USDA hardiness zones colder than the one it will live in. In other words, if you are in zone 6, you will need a rose that is rated for a zone 4. You can also add mulch to the pot. But keep mulch away from the plant itself. Wet materials close to the trunk or branches increase the chance of insects or disease. You could also take your rose plant indoors. I live in Oklahoma and my rose plant made it through the winter outdoors on my patio just fine. My zone in Tulsa is 6b and 7a. 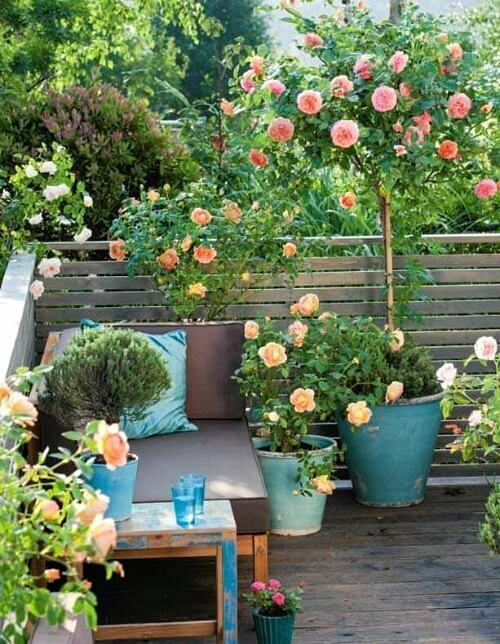 After you plant the climbing rose in your container, insert a trellis for it to climb on. Place the trellis toward the edge of the pot to avoid damage to the root system. Tie the canes of the miniature climbing rose lightly to the trellis as they grow, using twine or flexible floral wire. Brenda, thank you so much for this planting guide. I’m moving from a big house & yard to a small home & patio garden. This had me worrying about moving my roses from the ground to pots. Thank you again, Sandy. 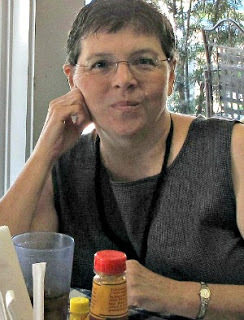 Hi Brenda, these are super tips. Love all the photos. 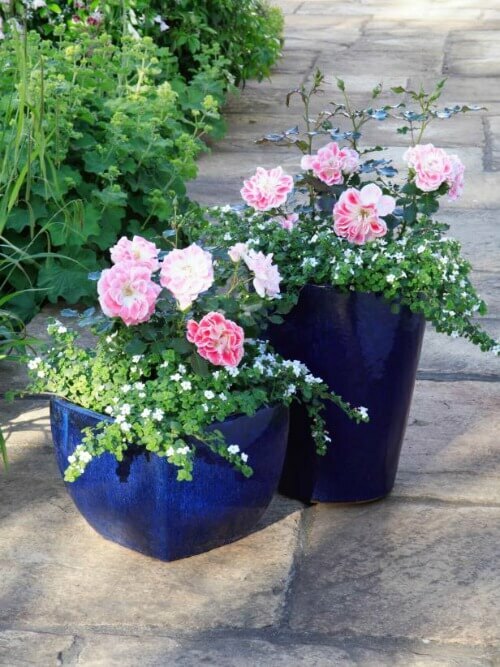 If I was gardening strictly on a patio I would absolutely still have to have my flowers and roses – this is a great guide for anyone considering growing roses in pots. I’m still awed by what Marie at 66 square ft was able to do on her teeny tiny patio in Brookly with all those climbing roses – gorgeous!! Now she has a larger area to garden in but I miss seeing photos of her awesome patio!